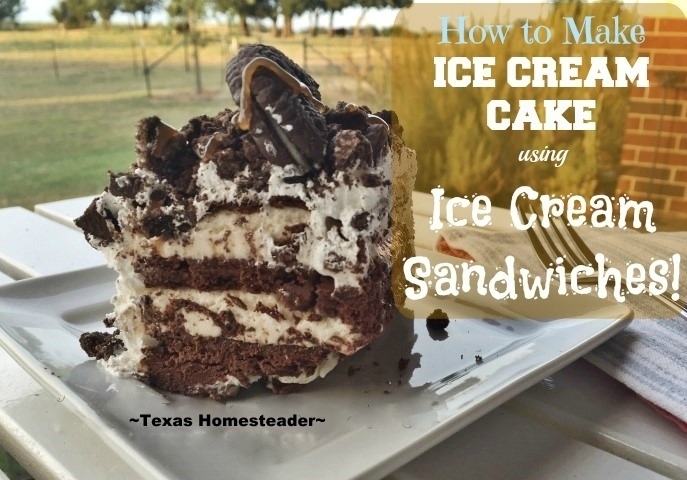 How To Make An Easy Ice Cream Cake Using Ice Cream Sandwiches! My son and his family recently stopped by for a visit and it was very close to his birthday. Now when he was little he always wanted to have an ‘unusual’ cake, especially since his birthday was during the heat of summer. One year I decorated a halved watermelon for him – he loved it! But often he asked for an ice cream cake. 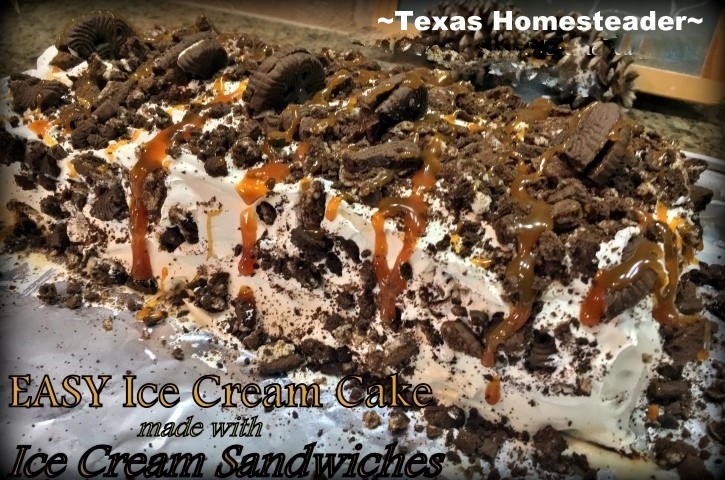 I mean c’mon, what’s better in the heat of a NE Texas summer than ice cream cake? Back in ‘the day’ I would plunk down an unreasonable amount of money to buy a dinky little ice cream cake at the store. But I soon learned how to make it myself both quickly as well as inexpensively. C’mon I’ll show you how! I took 1 cup of the whipped topping and added 1/2 cup of my homemade chocolate instant pudding mix and 1/2 cup of my homemade chocolate drizzle sauce. I stirred it all until it was thoroughly combined. It was still a little too thick for my liking so I added about 1 tablespoon of cold coffee to both intensify the chocolate flavor as well as thin the pudding for easier spreading. Perfect! I brought out a metal tray and lined it with foil. I smoothed on a single strip of the pudding mix to give my ice cream sandwiches a delicious chocolate-flavored cement to hold onto. LOL. Then I layered a row of 6 unwrapped ice cream sandwiches side by side. I topped that line of ice cream sandwiches with 1/2 of my chocolate pudding mixture while RancherMan brought out 6 more unwrapped ice cream sandwiches. I stacked them on top of the first row side by side and topped them with the rest of my pudding mixture. Then I added the final 6 unwrapped ice cream sandwiches to the top and put the whole shebangie into the freezer so it would get good and frozen again. I was a little disappointed to see that the ice cream sandwiches were trying to thaw for about an hour or so AFTER I put them into the freezer! I’m really not sure why they did this but it seems they did this last time as well. Now I brought my thawed whipped topping out of the refrigerator and spread it on all exterior surface of my ice cream cake. I wanted to make this cake cookies-n-cream flavored so I took a few chocolate sandwich cookies, cut them & half & set them aside. I gathered up about 10 more chocolate sandwich cookies, placed them in a zipper sandwich baggie, closed it up & rolled my rolling pin across it until the cookies were crushed. Then I sprinkled the crushed cookies on top of the whipped topping surface of my cake and decorated it with a line of the halved cookies I’d cut. Of course I wanted to add some ooey-gooey consistency so I drizzled the whole thing with caramel sauce since I had some leftover in the refrigerator. Mama always said presentation is half the dish and this cake turned out BEAUTIFUL! Mix 1 cup of whipped topping, 1/2 cup instant pudding mix & 1/2 cup ice cream topping until combined. If needed for easier spreading, thin with a tablespoon of milk or cold coffee. Set aside. Unwrap all ice cream sandwiches and place them back into the freezer so they remain cold. 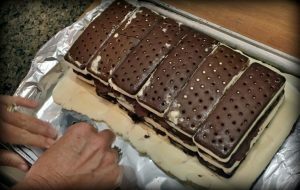 Add a thin line of your pudding mix to a platter and set a row of 6 of the unwrapped ice cream sandwiches side by side. Top the row of ice cream sandwiches with 1/2 of the pudding mixture. Then place 6 more unwrapped ice cream sandwiches directly on top of the previous ones. Top that stack with the remaining pudding mix and stack the final 6 unwrapped ice cream sandwiches on top. 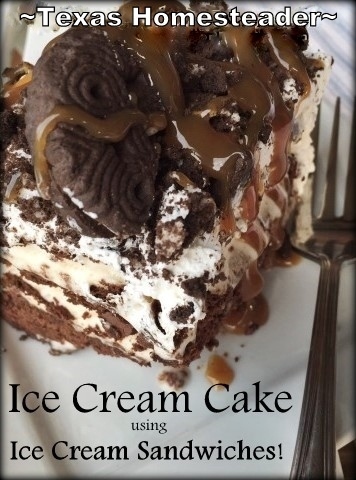 Place the assembled ice cream cake into the freezer to freeze solidly, about an hour. After about an hour bring the cake out of the freezer and spread whipped topping over entire surface of cake. If desired, top with crushed cookies and decorate with drizzled chocolate and/or caramel sauce. Return to freezer for at least an hour before cutting & enjoying. 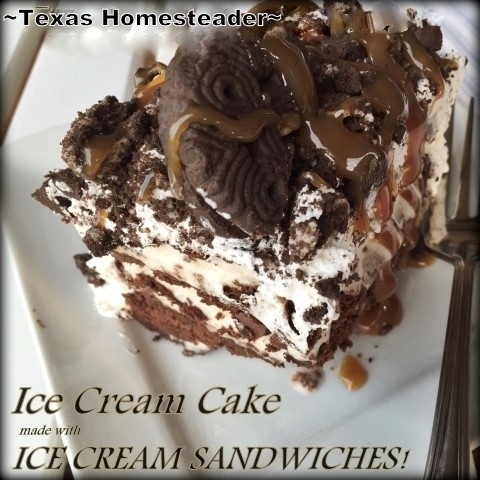 This entry was posted in Blog Posts and tagged Frugality, Make-It-Yourself, Recipes, Summer on September 3, 2016 by Texas Homesteader. That looks so easy and delicious! Thanks for sharing on the What’s for Dinner link up! Yummy and decadent. Thank you for sharing for with us at #HomeMattersParty. We would like to see you again next week. OMG. I think I could eat that for breakfast right about now :} Dang, that looks absolutely Delicious. Yes, make sure your tray, etc. is good and cold and extra tip; as you do each and every layer of ice cream sandwiches, place in freezer for a bit and making sure your pudding mixture is good and cold as well before spreading each and every layer. Remember, your hands are warm so your ice cream sandwiches will get rather soft real quick like so by placing in freezer (for about 30 min.) between each and every layer does help and decorate just before serving. You can also line a very cold (frozen) bread pan with foil and layer everything in it and when ready to serve, lift out the foil and finish up with your decorating.